We each like aesthetically pleasing color palettes and thought it would be cool to use them to see general differences between cities around the world. 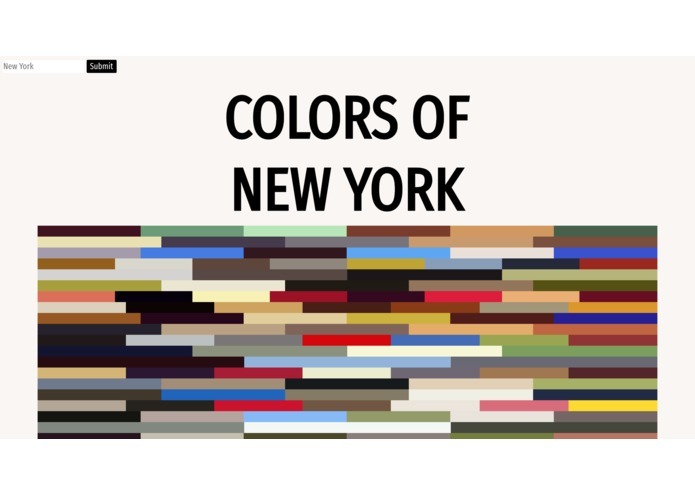 This web app takes searches for any city and uses featured photos of the 20 most popular places in that city to generate color palettes for each place, resulting in a page full of colors that make up the city. We used Foursquare's API to get information about any city's most checked-in places and a photo from those places. Then we used Clarifai's API to get the hex values of the most dense colors of said photos. The backend was made with Flask. Our first challenge was thinking of an idea, but after a couple hours of talking and brainstorming everything we thought of together, we ran into this and we all liked it. Understanding the APIs was also a challenge and took a good amount of time. Our final challenge was deployment and hooking up the .tech domain to redirect to our website. We'd like to maybe get more colors out of the pictures using an API other than Clarifai's. We'd also like to improve UX and have more animations. We wanted to give information on the colors as well, but didn't have time and prioritized showing the different places in the cities rather than the hex values/names of the colors generated from those places.